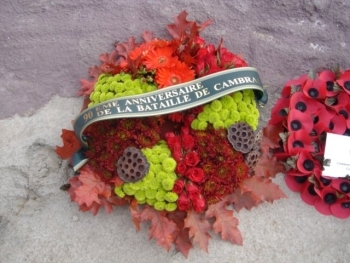 The celebrations to commemorate the 90th anniversary of the Battle of Cambrai can be considered as a great success. At every occasion the expected attendance was always exceeded. We will comment on just a few of the events and include some photographs so that those who were unable to attend can gain an idea of what took place. Naturally there were many more celebrations, exhibitions, remembrance services, and receptions than we can detail here. 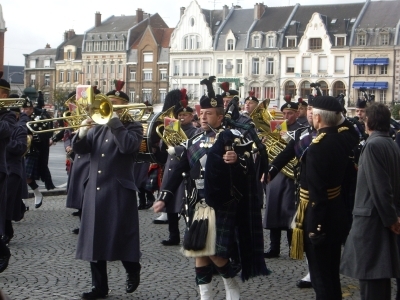 The whole area and villages around Cambrai played their part and naturally made the visitors very welcome. One item that had not been previously mentioned was that the Education Office decided that every class of every school in the area should join in with projects and make a visit to the exhibition, the MkIV Tank Deborah and the Battlefield of Cambrai. It was thought that this would be an excellent way of ensuring that the memory of such an important historical event will never fade. The keen interest shown by children and young people of all ages was quite amazing. The week commenced with a large exhibition in the Town Hall. The Mayor had considered the event was of such importance that he exceptionally allowed the beautiful Main Hall of Ceremonies to be used. This meant there was great interest in the exhibition and the attendance was so high, it was decided to extend the opening a further week. We must thank the Mayor and his staff for all their assistance and cooperation. Also thanks are due to the many volunteers who welcomed the visitors and also lent part of their own military collections. Special thanks must go to Bernard and in particular to Julien Lesnes. Another surprise event happened rather unexpectedly. A group of Royal Tank Regiment Soldiers had cycled many kilometres from their camp to Dover, then swam the same distance as the English Channel in a Dover swimming pool and finally ran from Calais to the Main Square in Cambrai. They were sponsored and donated many thousands of pounds to Charity. They were welcomed at the Town Hall and then went for a much needed rest! The numbers attending the week from all over the world was quite amazing. Apart from every country in Europe, there were representatives from Australia, New Zealand, Canada, America and many others. There was a real international atmosphere to the whole week. Not only were there a number of more serious memorial services, there was also a sense of celebration. One young couple had come simply to visit the grave of a grandfather and found themselves involved so much, they attended all the events and spent two days walking from cemetery to cemetery to visit as many as they could. 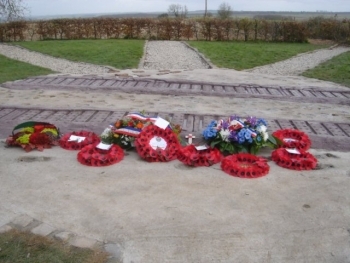 A group of volunteers then visited each cemetery and placed a memorial poppy cross on behalf of The Royal Tank Regiment on every grave of a Tank Corps casualty. Visits to the battlefield and the Tank Deborah arranged by the town of Cambrai were fully booked and at times the mini buses were arriving as another left. At the same time coaches from Battlefield tours were continually arriving to visit the tank. Another very moving event was a service at Bourlon for the funeral of a German soldier whose body had been recently discovered. This was followed by a war memorial service in the village and then the burial in the German Military Cemetery of Cambrai. Following a musical evening in the church at Fontaine-Notre-Dame when there were readings of the poetry of Ewart Mackintosh, the famous war poet who was killed close to Cantaing, a memorial service was held the next day at his graveside in l'Orival Wood Cemetery in Flesquieres. The whole party then proceeded to a small ruined chapel which was then dedicated to the poet and his fellow soldiers in the 51st Highland Division and will be now be restored. Colin Campbell who wrote a book on Mackintosh attended and spoke at these three events. At the end of the week, the new monument at Flesquieres to the Nations that took part in the 1917 Battle of Cambrai was unveiled and dedicated. Again the numbers attending were almost overwhelming. Many coaches of international visitors arrived as well as local residents. It is estimated that about 1,500 were present. The ceremony was quite innovative and although the usual formalities were fully observed, there were also celebrations, re-enactment and music. The commencement of the ceremony was very evocative. A cannon was fired and from the distance came eight men wearing Tank Corps uniform, walking very slowly as a memory march to represent the crew of a MkIV tank. Like 90 years ago, behind were the pipers to represent the Highlanders who climbed the very same path to go 'over the top'. Philippe Gorczynski first related the idea behind the conception of the monument and explained the reasons for its unusual evocative style. 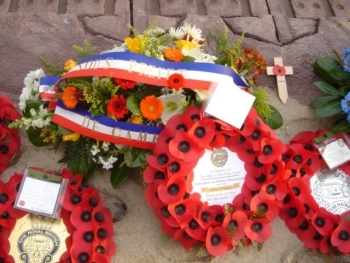 Wreaths at the new Monument at Flesquieres. The monument was dedicated by the Archbishop of Cambrai and unveiled by General Leakey, The Colonel Commandant of The Royal Tank Regiment An orientation table in three languages was then unveiled. The French were well represented by persons of the highest authority. 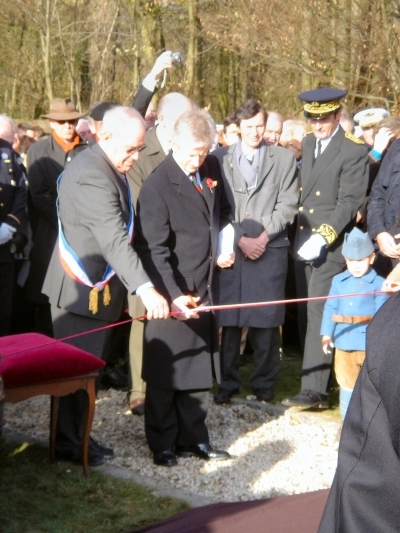 (Left to right) Gerard Drain, Mayor of Flesquieres, General Leakey, François-Xavier Villain, Mayor of Cambrai, M. Alain Rousseau, Sous-Prefet of Cambrai, cutting the tape to unveil the new monument at Flesquieres. 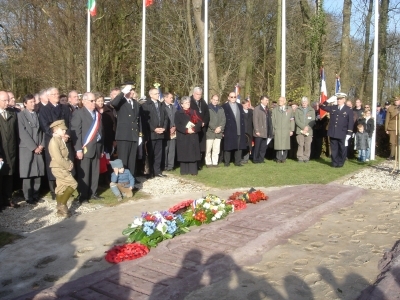 A number of surrounding villages were represented by their Mayors as well as the Mayor of Cambrai. Following the excellent ceremony a reception was then held in the village by the Mayor of Flesquieres. Over the next few days, visitors continued to come in large numbers, one of whom had brought the ashes of a relative who fought in the Battle to scatter them over the very ground where he fought in November 1917. At the end of the Saturday afternoon, an historical retrospective took place on the main square of Cambrai. A film was projected on the town hall wall and a replica of a WW1 tank paraded around the square followed by the Somme Battlefield Pipe Band. 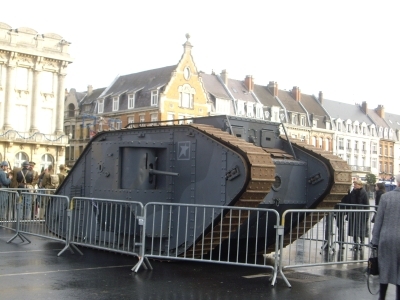 Model working tank in the Main Square of Cambrai. 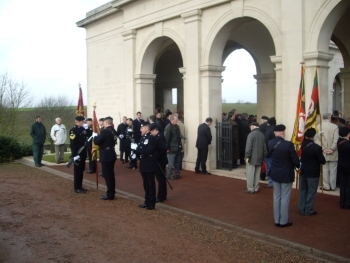 The morning of the 25th November started with a service at Louverval Memorial. All representatives of the Royal Tank Regiment were present during that very moving ceremony which ended with laying of wreaths. 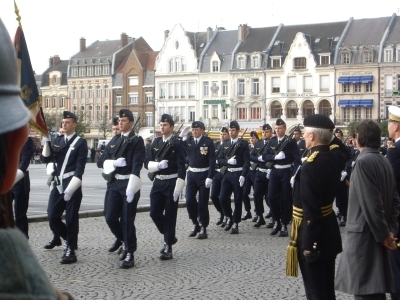 On the final day, the troops of The Royal Tank Regiment, The Army Base of Cambrai and Veterans paraded and marched around the Main Square of Cambrai with band playing and colours flying when General Leakey took the salute prior to a final remembrance ceremony at the Victory Memorial. 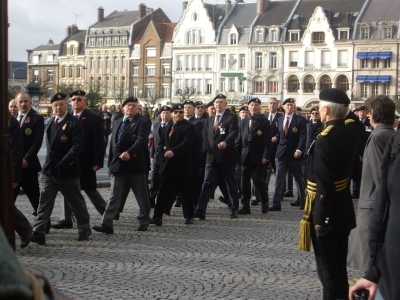 Parade of troops and Veterans in the Main Square of Cambrai. 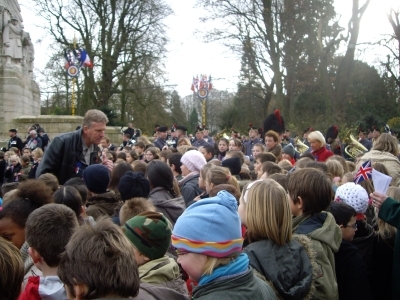 Two hundred local children sang the National Anthems and a bugler sounded the Last Post and Reveille.